QUESTION 1 – How do I register an account? Answer: To be able to buy from Jokasports.com, you will need to register an account with us and you will have the option of choosing between our ordinary membership and platinum membership. Their respective privileges and benefits are addressed in question 3 below. How to purchase Platinum Membership? 1. Click “Create an account*” with us on our homepage [Under the “Sign in” Tab] and pay $18 for a 1-year platinum membership to start enjoying platinum membership prices/benefits. 2. Upon checking out your shopping cart, you will be brought to a page where you will have the option to make payment as a “JOKA Club Ordinary Member” OR as a “JOKA Club Platinum Member”, click “Sign up Platinum Membership” and fill in all the necessary details to create an account* with us. Once all these are done, you will be able to check out all items at platinum membership prices. 3. Go to Membership under the Products tab and click “Sign up now”. Your one year platinum membership is now being added to your shopping cart. You may then either proceed to pay $18 for the one year platinum membership or you may continue to shop and checkout the one year platinum membership together with your other items. * Agreeing with the terms and conditions of our membership policy. How to get your Ordinary Membership? 2. 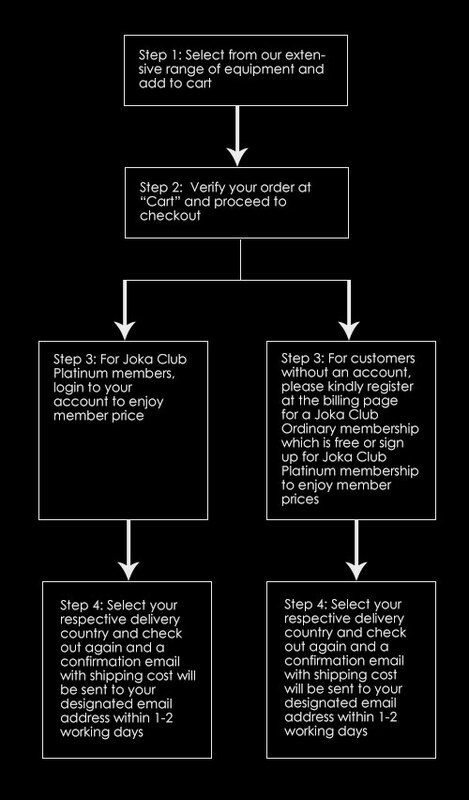 Upon checking out your shopping cart, you will be brought to a page where you will have the option to make payment as a “JOKA CLUB Ordinary Member” OR as a “JOKA Club Platinum Member” Click “No, I do not want to sign up the Platinum membership” and fill in all the necessary details to create an account* with us. QUESTION 2 – How do I create or change my password? Answer: For your account security you will be asked to set up a password to your account. If you are unable to remember your password simply select “Forgot Password” on the Login page, you will then need to input your email address and follow the steps in the email to reset your password. If you are still having problems you will need to contact jonathan@jokasports.com who will then reset it for you. After that you will be able to re-assign a new password using the Account section. 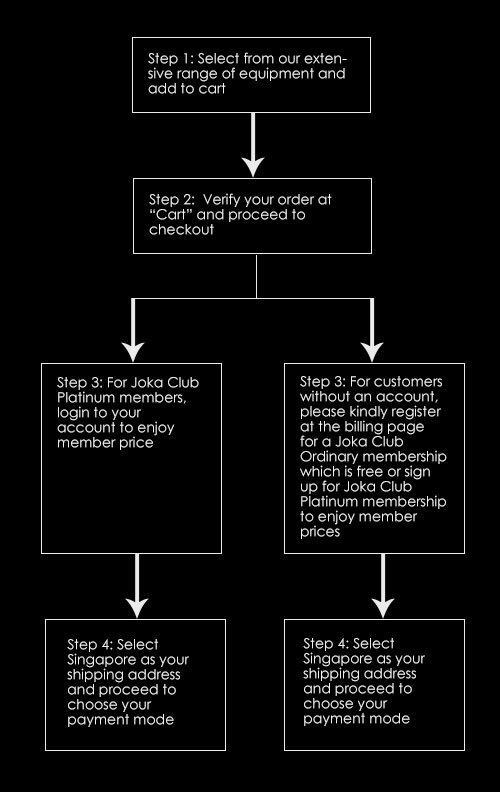 QUESTION 3- What is the difference between JOKA Club Platinum and Ordinary Membership? Up to 30% off all products! Get to purchase promotional sales items! Get to enjoy free local delivery for order above S$110! Be the first to receive exclusive updates on upcoming Sale events! What’s more? Enjoy the latest product preview before public release! At just $18 a year! So what are you waiting for? Sign up NOW to be our Platinum Member! Get to enjoy shopping at our website! QUESTION 4 – How do I upgrade from JOKA Club Ordinary Membership to Platinum Membership? Answer: 1. Upon checking out your shopping cart, you will be asked to login to your account. After you login, you will returned to the same billing page where you will have the option to make payment as a “JOKA Club Ordinary Member” OR as a “JOKA Club Platinum Member”, click “Sign up Platinum Membership” and fill in all the necessary details to create an account* with us. Once all these are done, you will be able to check out all items at platinum membership prices. 2. Go to Membership under the Products tab and click “Sign up now”. Your one year platinum membership is now being added to your shopping cart. You may then either proceed to pay $18 for the one year platinum membership or you may continue to shop and checkout the one year platinum membership together with your other items. QUESTION 5 – How do I renew my Platinum Membership? Answer: In order to continue enjoying your JOKA Club platinum member privileges, you may renew your platinum membership by repurchasing the 1 year platinum membership. A renewal notification will be sent to you via SMS/Email 1 month before your platinum membership expires. QUESTION 1 – How do I buy online? QUESTION 2 – What payment options are accepted? For now, we accept Paypal (Paypal account is not mandatory; VISA, Mastercard and AMEX are accepted) OR cash on delivery. More payment options will be added in the near future! For now we only accept Paypal (Paypal account is not mandatory; VISA, Mastercard and AMEX are accepted). More payment options will be added in the near future! QUESTION 1 – Will I get confirmation of my order? A confirmation email will be sent to your designated email address immediately after you chose your payment options. This will serve as a confirmation of your order with us. An email will be sent to your designated email address within 1 to 2 working days to advise you on the shipping charges after you checkout your shopping cart. This is to allow us to find the best and most competitive priced courier for your shipment. Once you received the email, you can log into your account to make payment via paypal and paypal will send you a confirmation receipt after you had made your payment and this will serve as a confirmation of your order with us. QUESTION 2 – What are the available delivery options and its charges? For local order of $110 and below, there will be a charge of $18 delivery fee for a one-time delivery service. Please note that if nobody is at your house to receive your order at the scheduled delivery timing, you can either self-collect at our Joka Sports showroom OR you can pay another delivery fee of $18 to get us to deliver to your home. If you are unable to receive your order at the scheduled delivery timing, please inform us at least 24 hours in advance. Alternatively, you can self-collect at NO charges at Joka Sports showroom [Address: 1 Yishun Industrial Street A’posh Bizhub S768160 from Wednesday to Friday, 2.30pm to 8.30pm and Saturday to Sunday, 12pm to 6pm]. *Exclude Jurong Islands, Tuas and Sentosa. $18 delivery fee applies for a one-time delivery service. Please note that if nobody is at your house to receive your order at the scheduled delivery timing, you can either self-collect at our Joka Sports showroom OR you can pay another delivery fee of $18 to get us to deliver to your home. If you are unable to receive your order at the scheduled delivery timing, please inform us at least 24 hours in advance. Free island wide* delivery will be not be applicable for ordinary member regardless of the amount of local order. An email will be sent to you within 1 to 2 working days to advise you on the shipping charges after you checkout your shopping cart. This is for us to find the best and most competitive priced courier for your shipment. Once you received the email, you can log into your account to make payment via paypal. Please refer to the table below for the estimated delivery charges to your respective countries. For countries other than the above stated, please email us at jerry@jokasports.com for an estimated shipping cost. QUESTION 3 – Do you deliver to countries that are not specified above? Answer: Yes, we do make delivery to most countries all around the world. For delivery to countries that are not specified above, please email us at jerry@jokasports.com to find out more about the delivery charges to your respective country. QUESTION 4 – Do you provide overseas delivery for items that are not sticks or blades? Answer: Yes, we do provide overseas delivery for items that are not sticks or blades. Please email us at jerry@jokasports.com to enquire on the delivery charge for such orders. QUESTION 5 – Are customs charges and import duties included? Answer: If you order goods from our website for delivery outside Singapore, they may be subjected to import duties and taxes which will be levied when the order reaches the delivery address. You will be responsible for payment of any such import duties and taxes. Neither we nor your overseas delivery provider, have control over these charges and will not be able to predict the amount. For further information please contact your local customs office before placing your order. Please refer to our delivery policy for more information. QUESTION 1 – Do you have any stick selection guide for beginner floorballers? Are you a right-handed or left-handed? Internationally, right-handed players shoot left and left-handed players shoot right. Shooting left means that you hold your left-hand lower on the stick than your right hand and the stick is on the left side of your body. But there is no hard rule to this, as most Asian players are influenced by hockey therefore your preference may be to have your stronger hand below. Most important among all is the length of the stick. The correct length of stick should reach about 2cm above your navel or if you prefer a stick that is longer then 3 fingers above will do just fine. Stick lengths can vary, with most senior players (male and female) using sticks from 92-103 cm. Junior players typically use sticks that are 85cm or below. Get the sticks cut to your preferred length by stating the length of your choice under “Remarks” when purchasing stick from us. The lower the number (eg. 2.3), the stiffer the shaft of the stick is. The higher the number (eg. 3.4), the softer the shaft of the stick is. Competitive players prefer a stiffer stick shaft for harder and more accurate shots. Under current regulations, the stiffest stick allowed in IFF-sanctioned competitive play is 23. To determine the right flex for you, consider that the more you weigh (more powerful you are in terms of strength) and the harder your shot is the stiffer the shaft of your stick should be. Players who are lighter in terms of weight should use a softer shaft stick. While a stiffer flex is great for shots, a softer shaft is better for stickhandling. Soft, medium and hard blades are the three textures of blades available. Soft blade gives you an edge in terms of ball control as the touch and feel is better while medium and hard blades gives you additional power when it comes to shooting. Pre-curved blades help you in terms of shooting and dribbling. Else, bend your blade to fit your style of play! The two available grip shapes currently are Round and Oval. Individual preference will determine which shape of grip you choose. Try it before deciding if you need! If you are still unsure, please feel free to email us at kweeann@jokasports.com and we will be more than happy to assist you. QUESTION 2 – How do we curve your blade? Answer: Please refer to our video link. IFF competition rules state that the curve of the blade cannot be more than 3 cm. This is measured from the highest point of the bottom edge of the blade to the ground, with the blade lying flat on the ground. QUESTION 1- Can I return an item? Answer: Please refer to our return policy. QUESTION 2- Can I make changes to my order? Answer: Unfortunately once an order has been placed we are unable to make any amendments or additions to the items on it as it will be locked into our system. We apologized for any inconvenienced caused! QUESTION 3– What should I do if the items I ordered are missing or damaged? For any other enquires, please feel free to email us at jokasports@gmail.com and we will reply you at the soonest.